Francis Marion Hotel, located in our historic holy city of Charleston, SC between the very famous Calhoun street and King street. This hotel dates back to early 1924 during the golden age of the railroads named after the war hero the ‘swamp fox". Then in 1996, it was fully renovated. This hotel features exclusives rooms and suites, 235 guest rooms and 18,000 functions space and 3 lavishing ballrooms, including the Carolina, Colonial, and the Gold ballroom, and the Swamp Fox restaurant. The Francis Marion Hotel seats directly across the street from the famous Marion Square park where many of the local Charleston events are held. As a part of being a Charleston wedding photographers, we love this hotel for so many reasons. While we can have total access to the hotel, we can also take our bride and groom and enjoy the historic backgrounds that our holy city has to offer, by giving our wedding clients spectacular wedding photography images that clearly speak Charleston, SC. Take for example this amazing image I created for my couple. You may think of looking at it that this wedding image for easy to take. No, it was not, there are so many elements that had to be put into place to capture this, and lots of lighting effect on balancing the ambient light the couple the dark interior at the time of the Bentley. Yes and do not forget to stand in a two-way lane at 11.30 p.m. while cars are passing you and yelling move out of the way. You see for me, I will go above and beyond the call of duty to create those spectacular wedding images for my clients. Because I have only one belief for every wedding I capture, that is always by pushing the envelope for that one day one time, there is no tomorrow and should I have done it are words that are past tense. 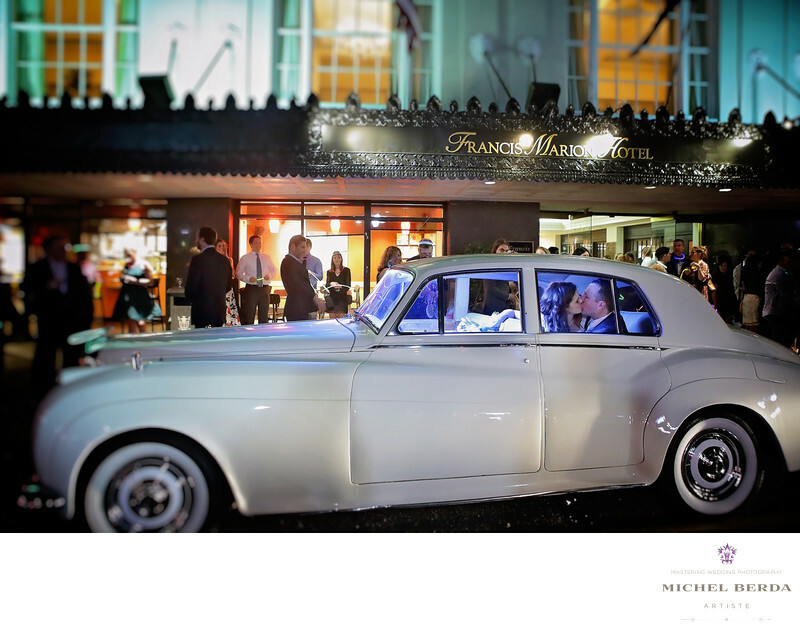 Keywords: Charleston (1179), Charleston Sc wedding photographers (6), Francis Marion Hotel (3), Francis Marion hotel wedding photographer (3), king street photo weddings (219), Michel Berda (1140), photographer (1125), Wedding Photographer (1254), Wedding photographer Francis marion hotel (3).